The ability to flip perspectives?! It means being able to leave the comfortable nest of our social habits and routines, common knowledge and “common sense”. One common goal we all share in DOKU.TECH is to observe the world and others from different, weird angles and perspectives. To move beyond asking only “How might we? But also…At what cost and to whom?”. The ability to change perspective has always been seen as something bold and ambitious, only the most courageous people have dared to come out of their socially constructed frames and raised their voice! But, this year we have decided to slip out of our comfort zone. 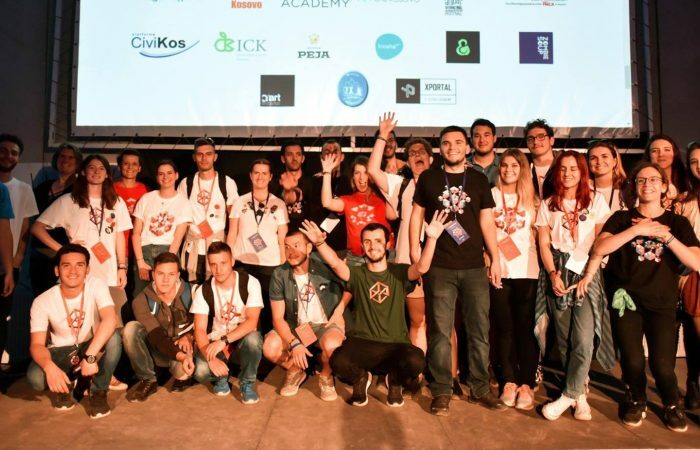 This year’s DOKU.TECH brought to Kosovo a diverse selection of perspective flippers; people from all over the world who are making real changes at the intersections of technology and society, culture, media, and economy. All because of their ability to see things differently! These 10 speakers shared their stories with people coming from the region and beyond. Starting with our first speaker Thomas Madsen-Mygdal who challenged the idea of technology leading us: “Tech is not above us. It should be governed by all of us”. Alex Qin, on the other hand, shared her personal story with the audience, on what she had to do in order to reach her success: “Shaving my head made me a better programmer!” said Alex, who inspired the whole audience through her journey of becoming a female programmer. DOKU.TECH would not be complete without the Do it yourself (DIY) Fair, where over 30+ organizations gathered in Termokiss. All of these organizations showcased their work and activities, bringing tech and information closer to the people. In addition, workshops were held during the two-day conference, which covered topics such as, entrepreneurship, technology, music, empowerment, and environment, which were held by the best in their field. What made this DOKU.TECH more special was the regional cooperation that we had with other Balkan countries. This year 45 participants coming from Serbia, Albania, and Macedonia had the opportunity to come to Kosovo, which for some it was their first time. For Ivona Djordevic from Surdulica, Serbia attending a tech conference in Prishtina was something that never crossed her mind: “It is my first time here in Prishtina and I found DOKU.TECH to be very educational and empowering”. One person’s craziness is another’s reality and in this DOKU.TECH we proved that this is true! Until the next edition, next perspective, this August 4th at Prizren during DOKUFEST.